Identification: Becker (1983); Page and Burr (1991); Sublette et al. (1990); Etnier and Starnes (1993); Jenkins and Burkhead (1994). Native Range: Great Lakes, Hudson Bay, and Mississippi River basins from New York and Ontario west to Minnesota, South Dakota, and Wyoming, and south to the Gulf; Gulf Slope drainages from Mobile Bay, Georgia and Alabama, to the Rio Grande, Texas. Also northern Mexico (Page and Burr 1991). Table 1. States with nonindigenous occurrences, the earliest and latest observations in each state, and the tally and names of HUCs with observations†. Names and dates are hyperlinked to their relevant specimen records. The list of references for all nonindigenous occurrences of Lepomis cyanellus are found here. Means of Introduction: Accidentally stocked as bluegill L. macrochirus or with other intended species (i.e., stock contaminant). In Hawaii, first discovered in the Western Kauai Lagoons. That site had been previously stocked with "bluegill" from various plantation reservoirs on Kauai; therefore, it is likely that L. cyanellus was present in Hawaii some time prior to its collection (Devick 1991a). It has been suggested that Green Sunfish were planted inadvertently in Lake Mead in 1937 (Holden and Stalnaker 1975). It may have reached the upper part of the Colorado River either by moving upstream from Lake Mead or by being introduced separately in that region (Holden and Stalnaker 1975). Status: Established in most locations where it has been introduced. Impact of Introduction: Green Sunfish appear to be at least partially responsible for local extinctions of California roach Hesperoleucus symmetricus in California (Moyle and Nichols 1974; Moyle 1976a, 1976b; Smith 1982). 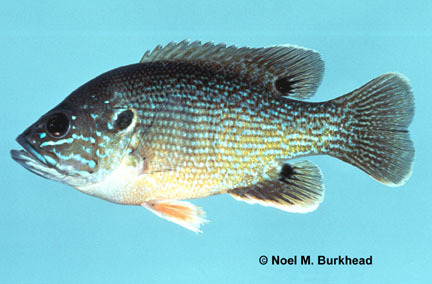 In California, aggressive Green Sunfish outcompete native Sacramento perch Archoplites interruptus (Moyle 1976a). They may chase Sacramento perch away from spawning areas and out of favored places, such as shallow weedy areas, and into open water (Moyle 1976a). Once in open water, the perch are more vulnerable to predation and have less available food. Introduced Green Sunfish also compete with and prey on other native fishes (Moyle 1976a; Lemly 1985). Lemly (1985) found that Green Sunfish reduced populations of native species, and altered population structure, relative dominance, and distribution patterns in North Carolina Piedmont streams. In that study, he found that Green Sunfish preyed heavily on minnows, and in fact, may have been responsible for the elimination of two cyprinid species in the study area. Introduced Green Sunfish prey heavily on the native Gila chub Gila intermedia in Sabino Creek, AZ (Dudley and Matter 2000). Green Sunfish may compete with and adversely affect young Colorado pikeminnow Ptychocheilus lucius, an endangered species (Karp and Tyus 1990). Green Sunfish readily hybridize with other Lepomis species (Moyle 1976a; Sigler and Sigler 1987). In cold lakes the often overpopulate and reduce trout populations (McKechnie and Tharratt 1966). Their large mouth allows them to compete with larger fish for prey items, and to prey on eggs and young of other fishes (McKechnie and Tharratt 1966). Green Sunfish and other introduced predatory centrarchids are likely responsible for the decline of native ranid frogs in California, California tiger salamander Ambystoma californiense populations (Hayes and Jennings 1986; Dill and Cordone 1997), and the Chiricahua leopard frog Rana chiricahuensis in southeastern Arizona (Rosen et al. 1995). Remarks: Tyus et al. (1982) gave a distribution map of this species in the upper Colorado basin. The Green Sunfish has been widely stocked in Ohio (Trautman 1981). But stockings appear to have taken place within its native range. Bradley, W. G. and J. E. Deacon. 1967. The biotic communities of southern Nevada. Nevada State Museum Anthropological Papers No. 13, Part 4. 201-273. Dudley, R.K. and W.J. Matter. 2000. Effects of small green sunfish (Lepomis cyanellus) on recruitment of Gila chub (Gila intermedia) in Sabino Creek, Arizona. The Southwestern Naturalist 45(1): 24-29. Etnier, D.A., and W.C. Starnes. 1993. The fishes of Tenneessee. University of Tennessee Press, Knoxville, TN. Halliwell, D.B. 2003. Introduced Fish in Maine. MABP series: Focus on Freshwater Biodiversity. Hayes, M.P., and M.R. Jennings. 1986. Decline of ranid frog species in western North America: are bullfrogs (Rana catesbeiana) responsible? Journal of Herpetology 20(4):490-509. Hocutt, C.H., R.E. Jenkins, and J.R. Stauffer, Jr. 1986. Zoogeography of the fishes of the central Appalachians and central Atlantic Coastal Plain. 161-212 in C.H. Hocutt and E.O. Wiley, eds. The zoogeography of North American freshwater fishes. John Wiley and Sons, New York, NY. Jenkins, R.E., and N.M. Burkhead. 1994. Freshwater Fishes of Virginia. American Fisheries Society, Bethesda, MD. Karp, C.A. and H.M. Tyus. 1990. Behavioral interactions between young Colorado squawfish and six fish species. Copeia 1990(1):25-34. Lemly, A.D. 1985. Suppression of native fish populations by green sunfish in first-order streams of Piedmont North Carolina. Transactions of the American Fisheries Society 114:705-712. Loyacano, H.A. 1975. A list of freshwater fishes of South Carolina. Bulletin of the South Carolina Experimental Station 580:1-8. Matern, S.A., P.B. Moyle, and L.C. Pierce. 2002. Native and alien fishes in a California estuarine marsh: twenty-one years of changing assemblages. Transactions of the American Fisheries Society. 131: 797-816. McKechnie, R.J., and R.C. Tharratt. 1966. Green sunfish. Pages 399-401 in A. Calhoun (ed). Inland fisheries management. California department of Fish and Game, Sacramento, CA. Moyle, P.B. 1976a. Inland fishes of California. University of California Press, Berkeley, CA. Moyle, P.B. 1976b. Fish introductions in California: History and impact on native fishes. Biological Conservation 9:101-118. Moyle, P.B. and R.D. Nichols. 1974. Decline of the native fish fauna of the Sierra Nevada foothills, central California. The American Midland Naturalist 92(1):72-83. Moyle, P.B. and J. Randall. 1999. Distribution maps of fishes in California. [on-line] Available URL at http://ice.ucdavis.edu/aquadiv/fishcovs/fishmaps.html. Rohde, F. C, R. G. Arndt, J. W. Foltz, and J. M. Quattro. 2009. Freshwater Fishes of South Carolina. University of South Carolina Press, Columbia, SC. 430 pp. Rosen, P.C., C.R. Schwalbe, D.A. Parizek, Jr., P.A. Holm, and C.H. Lowe. 1995. Introduced aquatic vertebrates in the Chiricahua region: effects on declining native ranid frogs. Pages 251-261 in DeBano, L.H., P.H. Folliott, A. Ortega-Rubio, G.J. Gottfried, R.H. Hamre, and C.B. Edminster, eds. Biodiversity and management of the Madrean Archipelago: the sky islands of southwestern United States and northwestern Mexico. US Forest Service, Rocky Mountain Forest and Range Experiment Station. Fort Collins, CO.
Sigler, W.F., and J.W. Sigler. 1987. Fishes of the Great Basin: a natural history. University of Nevada Press, Reno, NV. Smith, J.J. 1982. Fishes of the Pajaro River system. Pages 83-170 in Moyle, P.B., J.J. Smith, R.A. Daniels, T.L. Price, and D.M. Baltz, eds. Distribution and ecology of stream fishes of the Sacramento-San Joaquin drainage system, California. University of California Press. Berkeley, CA. Sommer, T, B. Harrell, M. Nobriga, R. Brown, P. Moyle, W. Kimmerer, and L. Schemel. 2001. California's Yolo Bypass: Evidence that flood control can be compatible with fisheries, wetlands, wildlife, and agriculture. Fisheries. American Fisheries Society. 26 (8): 6-16. Starnes, W.C., J. Odenkirk, and M.J. Ashton. 2011. Update and analysis of fish occurrences in the lower Potomac River drainage in the vicinity of Plummers Island, Maryland—Contribution XXXI to the natural history of Plummers Island, Maryland. Proceedings of the Biological Society of Washington 124(4):280-309. Trautman, M.B. 1981. The fishes of Ohio. Ohio State University Press, Columbus, OH. Tyus, H. M., B. D. Burdick, R. A. Valdez, C. M. Haynes, T. A. Lytle, and C. R. Berry. 1982. Fishes of the upper Colorado River basin: distribution, abundance, and status. Pages 12--70 in W. H. Miller, H. M. Tyus, and C. A. Carlson, editors. Fishes of the upper Colorado River system: present and future, Western Division, American Fisheries Society.